When an alarm goes off, you’ll hear a sound and see a notification that you can snooze or dismiss. It appears even if the app is closed, sound is muted, or your PC is locked. You can even dismiss alarms from the lock screen without unlocking it. However, in most cases, alarms won’t sound if your PC is asleep, and never when it’s shut down. Notes: Some newer laptops and tablets have a feature called InstantGo, which wakes up the device to sound an alarm even if the device is asleep. However, it must be plugged in to AC power to ensure that it will wake up. 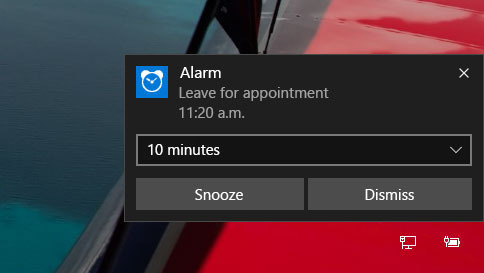 If you don’t have InstantGo, when you add a new alarm you’ll see a warning that alarms only work when your PC is awake. If sound is muted, you won’t hear the alarm, but you’ll still get a notification. 1 – in the Alarms & Clock app, select World Clock, then New + at the bottom. 2 – insert the first few letters of the location you want, then select it from the drop-down list. If you don’t see the one you want, enter another location that’s in the same time zone. 3- select Convert times (the 2 clocks at the bottom), then move the slider to select a new time to compare. 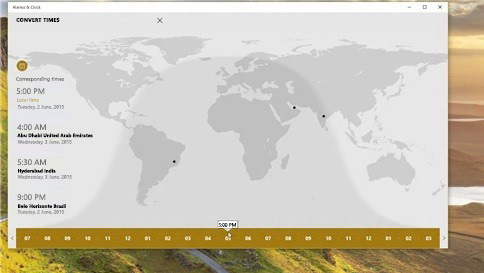 Select a location on the map to change which place the slider refers to. 4-to exit Convert Times mode, select the Back button, or press Esc. IF I SHUT DOWN THE PC CAN THE ALARM STILL WAKE ME UP ? 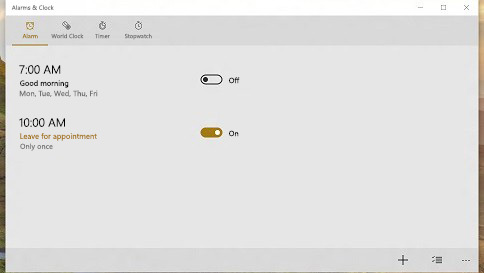 my computer is not muted or turned off/asleep but the alarm wont sound it will only show the notification how do I fix this if there is a way to fix it? I’m looking for a timer, and accessed what Windows provides. Unfortunately, after I set the countdown timer nothing happens. I also tried to use Cortina to get directions on the timer. But the response was that I don’t have the latest version of “Help” and that was the reason I don’t get information on how to use the timer. So I attempted an update but was informed that my system was up to date. It does seem to me that currently the right hand does not know what the left hand is doing anymore at Microsoft. if I put my pc on SLEEP mode the alarm that I set will wake me up? My alarm will not go off. The message says “Notifications will only show if the PC is awake,” but my computer IS NOT asleep. How can I convince the alarm app of this? that is exactly my frustration! i thought it was just ME that couldn’t get the alarm to work. all I wanted to do was set an alarm for me to put the clothes in the dryer, while I surfed the net. nothing, I mean NOTHING happened! I have windows 10 but it still says “Notifications will only show if the PC is awake…” Is there anything I need to update or change? How Alarm snooze functionality behave while my system is in sleep mode? whether alarm will ring after snooze time, when my system is in sleep mode..!! How to silence a preset, daily, audible alarm (after a predefined time period) that is triggered when I am away from the PC (and the PC is on)? When I open alarms and clocks, I get a screen where I can set the time that I want but there doesn’t seem to be anywhere to start the alarm. Can you help? This is a nice list of people’s problems but I fail to see any answers. So what is the purpose of this “Forum”? So why should I ask my question about the timer? It runs but it doesn’t alert me when the time is up. It used to but something happened that it doesn’t anymore. I don’t expect an answer. Surprise me if you care! I depend upon the alarm to tell me when it is time to dispense medication to my wife. It is set for five times a day. For awhile it worked fine, but now it frequently simply does not sound. When that happens it sometimes appears without the sound in notifications and sometimes, it is nowhere to be found. I cannot depend on it so I’m left to seek other ways external to the computer including my own imperfect memory. If I restart the computer, the alarm works maybe once or twice and then stops. What can I do to assure the alarm will sound as instructed to?